Located on the edge of the World Heritage listed Cradle Mountain National park, the sanctuary is situated within a beautiful natural alpine setting of rainforest and grasslands with views of Cradle Mountain. Our award winning enclosures are built to a high standard and provide range of natural habitat and behavioral opportunities. Visitors will experience the operation of a working sanctuary, whilst enjoying up close encounters and educational insights with the knowledge your entry fees are contributing to the conservation of these amazing animals. 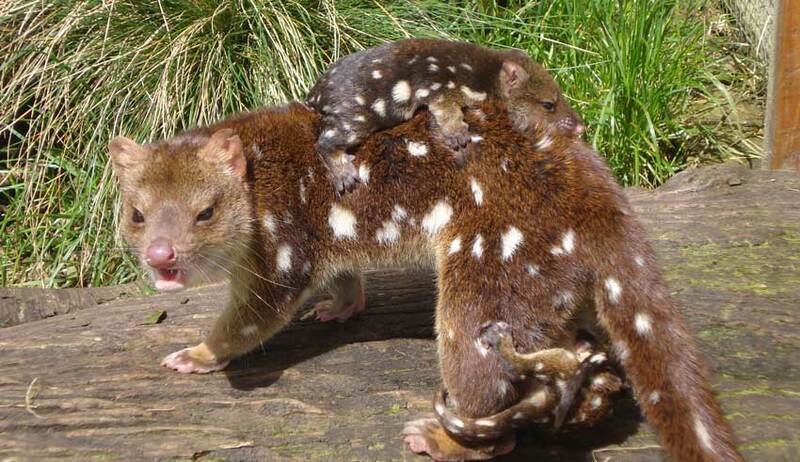 The carnivorous marsupial family “Dasyuridae” comprises of several genera including Sarcophilus and Dasyurus. Devils@Cradle focuses on conservation programs for the three largest carnivorous marsupials – the Tasmanian devil (Sarcophilus harrisii), the Spotted-tail quoll (Dasyurus maculatus) and the Eastern quoll (Dasyurus viverinus). All three of these species are currently listed as either threatened or endangered in the wild and all occur locally in the Cradle Mountain area. The Tasmanian devil is the largest of the world’s carnivorous marsupials, with males and females weighing around 10.0 kg and 7.0kg respectively, larger males commonly reach 11-12 kg. A solitary species who has evolved into a very effective scavenger, they have a strong build and powerful jaws capable of crunching and consuming bones efficiently. An opportunistic hunter, devils will eat almost anything from insects, amphibians and reptiles through to larger species such as possum, wallaby and wombat. They rely largely on their sense of smell and their endurance when searching for food. The reproduction cycle for this species (and all dasyurids) is quite complex. Breeding occurs between Feb-March, the female will accept multiple males during her 7-10 day cycle and 18-21 days later she will give birth to up to 40 young. With only 4 teats in the pouch it is a case of the strongest survive, once attached to the teat the young will remain within the pouch for around 4 months, at this point they are fully furred and too large for the pouch. They remain within the den for another 4-5 months during this time their diet will change to become largely carnivorous and become fully independent and disperse at 9 months of age, around Nov-Dec. Their lifespan is 5-6 years. The species is very adaptable and finds suitable habitat throughout Tasmania’s diverse landscape, from the alpine mountainous areas through to the coastal environments surrounding the island and everywhere in between. Found only in Tasmania, the species is believed to have been forced into extinction on mainland Australia following the introduction of the dingo. The species has recently been classified as ‘endangered’ following a decline of up to 85% across its natural range due to a contagious facial cancer known as Devil Facial Tumour Disease (DFTD). In addition to DFTD another major threat to this species is roadkill, with a smorgasbord of carrion available along the road devil religiously use these ‘man made’ tracks, so please take care when travelling our roads after dark. The Spotted-tail quoll, is the largest of the quoll family native to Australia, with males and females weighing around 4.0 kg and 2.0 kg respectively. Largely territorial, they are considered an apex predator, their prey consists of insects, crayfish, lizards, snakes, birds, domestic poultry, small mammals, platypus, rabbits, arboreal possums, pademelons, small wallabies, and wombats, the latter of which are much larger than themselves. The breeding season begins in early winter and the female can raise up to 6 young in her pouch with weaning occurring in the spring, young generally disperse in November. Their lifespan is 3-4 years. The species lives in a variety of habitats, but seem to prefer wet forests such as rainforests and closed eucalypt forest. They are arboreal, but only moderately. This species is vulnerable to decline as it requires certain climates and habitats and it tends to live in low densities. The main threats to the Spotted-tail quoll are habitat removal, roadkill and illegal poisoning, trapping and shooting, due to the fact that they will kill poultry. Two subspecies are recognised, a smaller northern QLD subspecies and the larger which is found in small numbers in southeastern Australia and Tasmania, Tasmania is considered their last stronghold. The Eastern quoll, is a small to medium-sized carnivorous marsupial native to Australia, with males and females weighing around 2.0 kg and 1.0 kg, respectively. A fast and agile solitary predator, hunting at night for its prey of insects and small mammals, they have also been known to scavenge food from the much larger Tasmanian devil. The breeding season begins in early winter, and the female can raise up to 6 young in her pouch. Weaning takes place at about 10 weeks of age, with the young staying in the den whilst the mother forages for food, young disperse around November. Their lifespan is 3-5 years. Their habitat is varied and consists of alpine areas including grasslands, heathland, and rainforest through to dry grassland and forest mosaics, bounded by agricultural land even coastal environments. The main threats to the Eastern quoll is roadkill, competition and predation from feral cats and illegal poisoning and trapping as people often confuse this species with the larger Spotted-tail. The lack of foxes and dingoes in Tasmania is believed to have contributed to the survival of the species here on the island, considered extinct on the mainland they remain widespread in Tasmania. 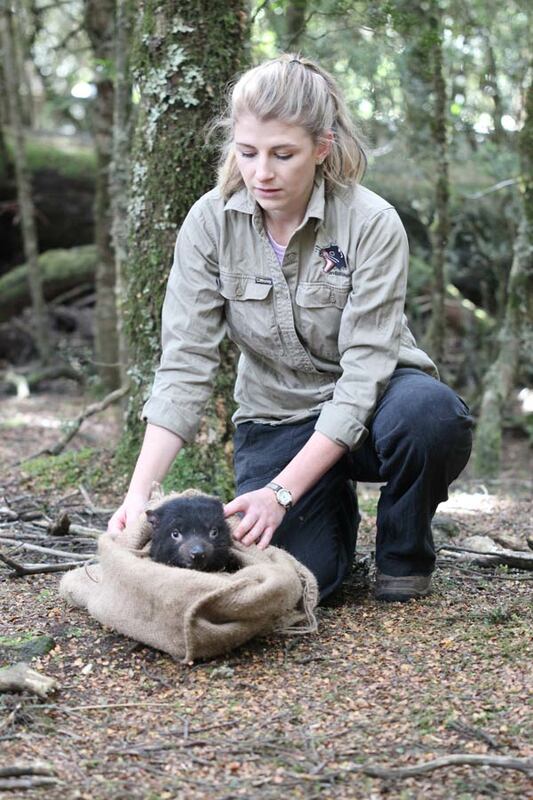 The sanctuary houses approximately 80 – 100 animals across the 3 species within industry recognised programs; the Save the Tasmanian Devil Program (STDP) and the Tasmanian Quoll Conservation Program (TQCP). 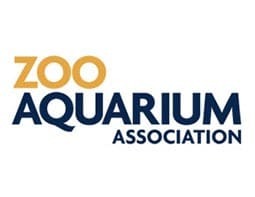 These insurance populations are supported by the Tasmanian government, the Zoo and Aquariums Association and various zoo and sanctuaries nationally and are crucial to the long term conservation of the species. The welfare of our animals is number one, we have well trained and experienced keepers ensuring best practice husbandry for our animals on a daily basis, our records are maintained within a global recording keeping platform and the breeding of our animals is managed using studbook keeping software and DNA analysis. Every year the program produces an Annual Report and Breeding Recommendations for each species. 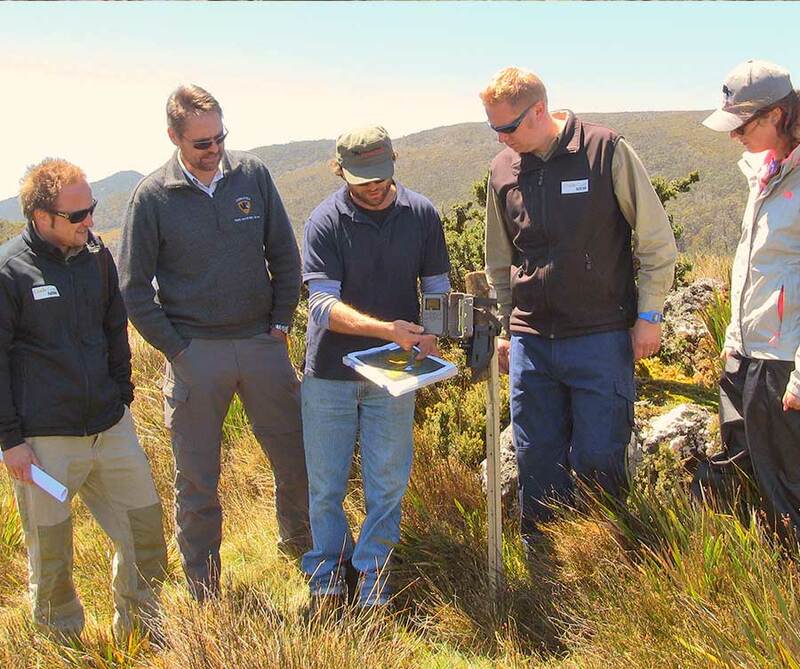 In addition to educating the many visitors to the sanctuary, we conduct a number of in-situ conservation initiatives within the Cradle Mountain area combining resources with the State and local Government, U-TAS, Parks and Wildlife Service, local operators and the community – we aim to make a significant contribution to the conservation of these species. 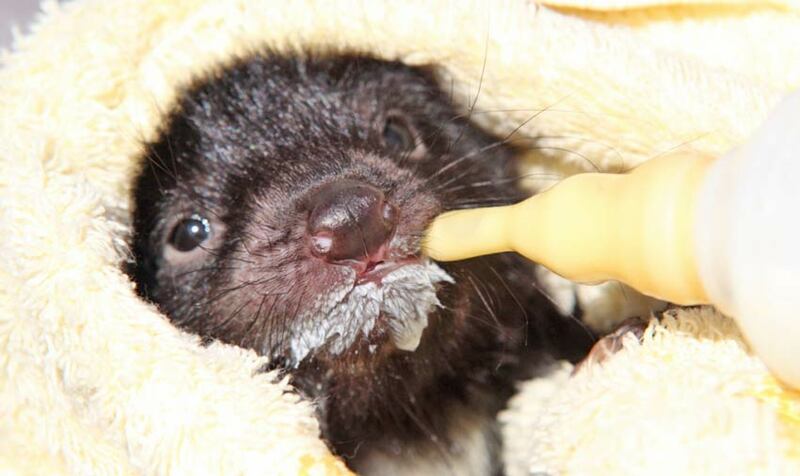 The sanctuary is a key facility for the Tasmanian Devil, we house approx. 40 (20.20) devils on site and we are involved in various elements of the program including breeding, national and international exports, release and re-introduction, field monitoring of wild populations and orphan rehabilitation. 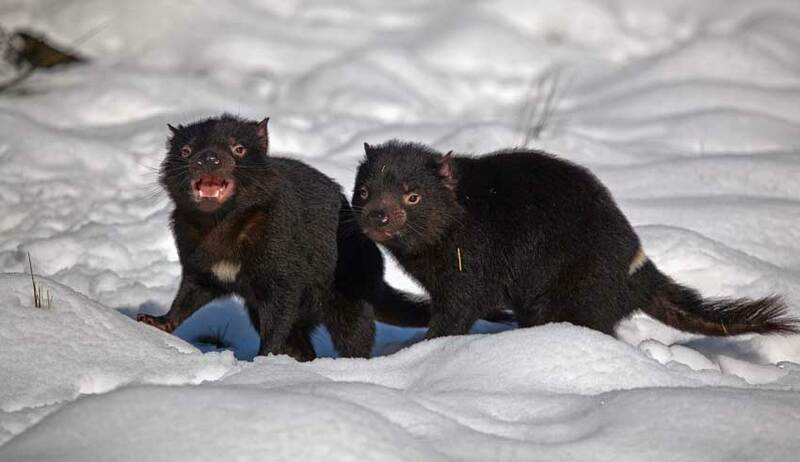 The Save the Tasmanian Devil Program was established in response to Devil Facial Tumour Disease (DFTD), a contagious cancer that has decreased wild populations by between 85-90% throughout Tasmania. The insurance population is made up of various captive facilities nationally housing approx. 700 animals. 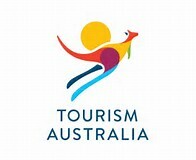 To find out more information about DFTD and the Save the Devil Program please visit the official website at www.tassiedevil.com.au. 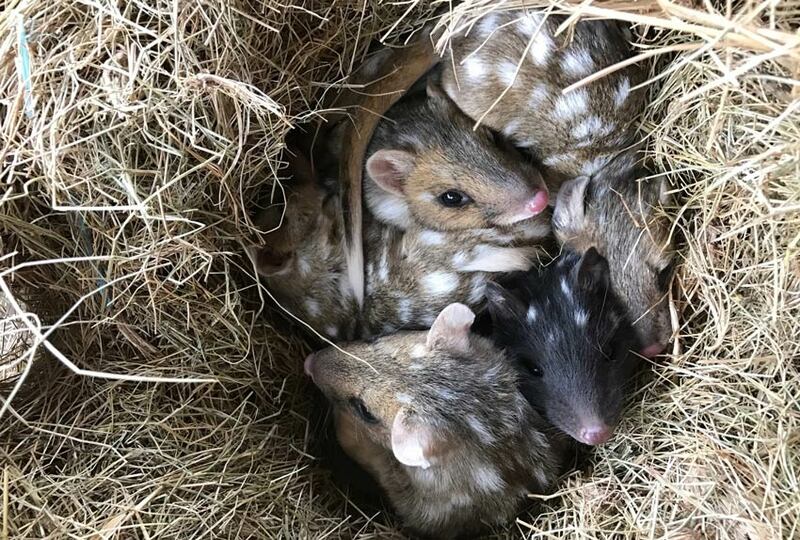 Established in 2010 the TQCP’s primary objectives are to maintain a genetically robust captive insurance population of both Spotted-tail and Eastern quoll. The population will assist in the prevention of extinction of these species by preserving a captive breeding population representative of all bio-regions throughout Tasmania and by providing a source population for reintroduction and re-establishment of the species as required. 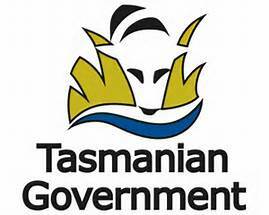 The program is supported by the Tasmanian Government, private stakeholders and independent scientists and the current insurance population (2018) consists of approximately 200 individuals across a number of facilities nationally. Devils@Cradle are the founders of the TQCP and have managed the programs coordination and the population’s studbook management since inception in 2010. As a key facility for both species we house approximately 10 (5.5) Spotted-tail and ~ 40 (20.20) Eastern Quoll at the sanctuary. The sanctuary is involved in various elements of the program including breeding, national and international exports, release and re-introduction, field monitoring of wild populations and orphan rehabilitation. The Field Monitoring Program has been operating since 2006 and aims to collect data on population dynamics of these three marsupial carnivores, and the prevalence of DFTD within the wilderness of Cradle Mountain. This is achieved through the use of remote infra-red cameras, road kill surveys, spotlight surveys and liaising with the local community and visitors to the sanctuary. 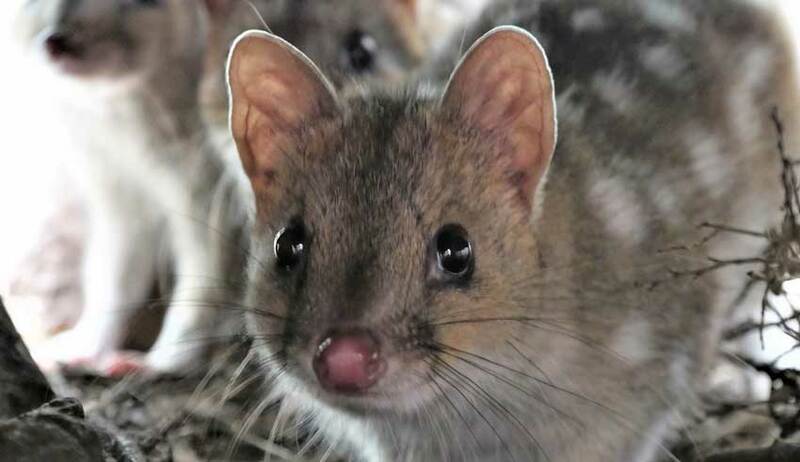 We have used unobtrusive IR camera monitoring techniques to survey populations of devils and quolls within the Cradle Mountain area for more than 10 years, this has provided invaluable insight into the local wild populations. 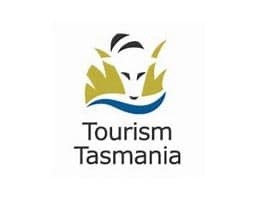 The ongoing work has been made possible through working closely with various organisations namely DPIPWE, Cradle Coast NRM, Save the Tasmanian Devil Program, University of Tasmania, Parks and Wildlife service, Tasmanian Land Conservancy and local operators and landowners. The associated field work includes; locating and checking of IR cameras and the retrieving and collating of data, our field staff are often assisted through volunteers and students to the sanctuary and over many years we have been able to collect valuable data that contribute to conservation efforts for these species. Devils@Cradle staff may receive a patient or two around spring time every year, and orphan rehabilitation is a role we cherish – there is nothing quite like being a mother to a joey devil or quoll and seeing them develop to maturity either within captivity or reintroduced back into the wild. With the risk of DFTD orphaned devils are managed under a specific set of protocol. 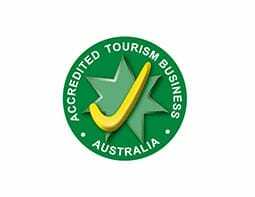 The facility is licensed under the government wildlife carer program and staff are trained and experienced in the hand-rearing of devils and quolls, as well as a number of other native species. Being on the doorstep of Cradle Mountain National Park, which is home to a diverse range of native wildlife, it is an important part of the job and is integral to conservation efforts for our endangered species – for some, one animal’s life can contribute significantly to the overall population. The program also works to assist in the treatment and rehabilitation of injured wildlife so that they can be safely returned to the wild.